PACCAR Australia annually recognises its top performing major suppliers in its Supplier Performance Management (SPM) program. The SPM program evaluates a supplier’s performance in the areas of product development, operations support and business alignment with PACCAR Australia objectives. Through the SPM program, cross-functional teams comprising suppliers and PACCAR Australia personnel collaborate to identify performance enhancements and to develop product innovations. The Supplier Performance Management program culminates with an annual Supplier of the Year Awards evening where the best performing suppliers in various categories are recognised. The PACCAR Australia supply chain includes approximately 70 major Australian suppliers located across the country. The majority of suppliers are Australian-owned companies located in the Melbourne region. Depending on the model and specification, a Kenworth truck comprises around 60 percent Australian-owned resources. Local suppliers provide a wide range of critical components: complex electrical harnesses, large fibreglass components, interior trim systems, fabricated/machined/welded metal components, radiator and charge air cooling packages, as well as paints and paint materials. The sustainability of this local supply base is also continually improved through the implementation of lean manufacturing techniques; investment in the latest machine tool technology and coordinate measuring equipment; carrying out Advanced Product Quality Planning (APQP); adopting the Production Part Approval Process (PPAP); and training in Six Sigma problem solving and process improvement methodologies. “The success of the Kenworth range in Australia is due to the company’s commitment to offer products that are designed and manufactured in Australia, with ongoing capital investment from PACCAR Inc. in the form of product research, design and manufacturing technology. “There is no doubt these exceptional suppliers are critical to our ongoing success. Congratulations to Comtech Industries for taking the overall award and to all the other winners on the night (listed below) for their outstanding efforts”. 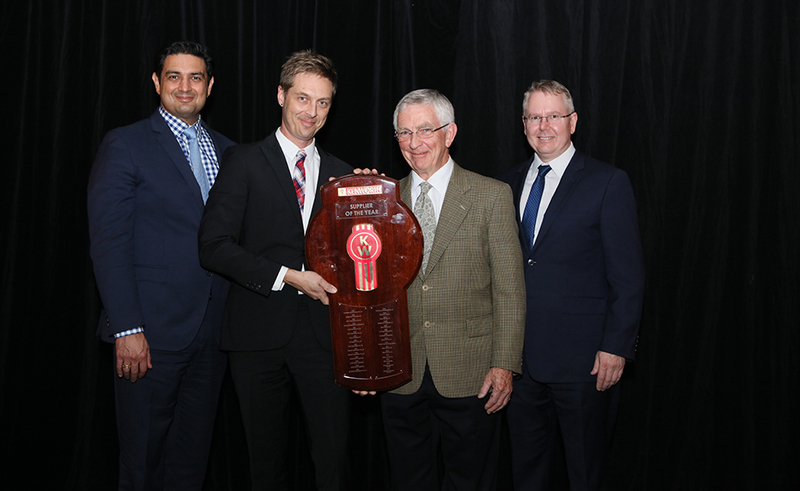 Image above: (L-R) Andrew Hadjikakou, Managing Director, PACCAR Australia; Tim Wall, Managing Director, Comtech Industries; Ray Wall, Founder of Comtech Industries, and Tom Cooper, Operations Director, PACCAR Australia.